The Biodiversity Stewardship community of practice has been focusing on enhancing the capacity and capabilities of biodiversity stewardship practitioners in support of expanding South Africa’s network of protected areas, whilst effectively securing conservation, land reform and rural development returns. A number of capacity building sessions were coordinated by SANBI’s Biodiversity and Land Use (BLU) Project for the Biodiversity Stewardship community during 2017 and 2018. These included two sessions on Biodiversity Stewardship practice which saw a total of 83 practitioners representing 27 different organisations in attendance. The represented organisations included two national departments, namely DEA and DAFF, SANBI, SANParks, Stewardship Managers and facilitators from 6 Provinces, representatives from the City of Cape Town and the eThekwini Metro; as well as eleven NGOs and four private businesses. The capacity building sessions included discussions and presentations focusing on biodiversity stewardship principles, legal frameworks and categories of biodiversity stewardship. Land owner agreements, site assessments, declaration processes, management plans, post-declaration support, benefits and incentives were also focused on during these sessions. The use of case studies was found to be very useful for participants, who were able to draw on their own experiences when discussing the case studies. The sharing of examples from different regions in order to highlight how the different regions implement biodiversity stewardship processes was beneficial to all. The Biodiversity Stewardship Technical Working Group which took place early this year at Kruger National Park in Skukuza, was another platform where capacity building of the Stewardship Community was undertaken. In support of building capacity for the successful implementation of Protected Area Expansion and Biodiversity Stewardship, attendees were treated to a session that focused on the legal processes required to successfully declare protected areas. More than forty participants including government officials and representatives from conservation NGOs were in attendance. The training was offered in response to the need expressed by biodiversity practitioners to have clarity on the correct process to be followed with regard to declarations, what and how pro-forma templates must be completed, and so forth, that previously resulted in extensive delays when sites were submitted for declaration. Capacity building and development is an integral part of the BLU project and cuts across the two components that frames the work the project is implementing. In relation to stewardship, the declaration process, management plan development, benefits, incentives and post-declaration support, to mention a few, are important capacity building and training areas that were identified by project partners in the stewardship space. 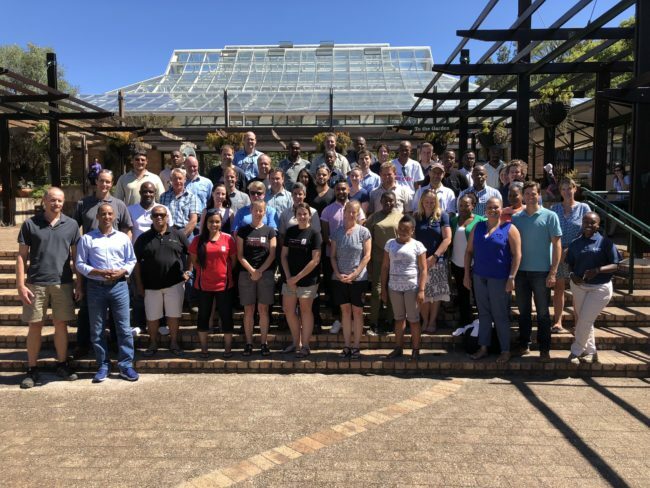 “These training events has highlighted the value of bringing biodiversity stewardship implementers together as it enables lesson sharing and partnership building,” said Natasha Wilson, biodiversity stewardship advisor at SANBI. Participants received several biodiversity stewardship resources and documentation for them to revisit at a later stage. Further capacity building interventions will be offered through the Biodiversity Stewardship Technical Working Group over the next 12 to 18 months. For more information on Biodiversity Stewardship capacity building sessions, please contact Natasha Wilson.